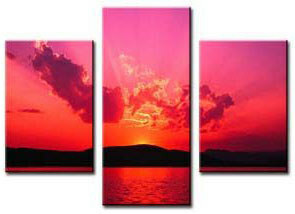 Triptych canvas prints are a fun and eye catching way to decorate your home or office. They work best with pictures of places and abstract images as the picture is split over three or more separate canvas panels. As some of the image is lost between the panels it is better to choose photos and images that won’t lose any important detail because of this. They are ideal for larger wall spaces and can be as creative as your imagination allows. It is best to have the photo wrapping around the edges of the stretcher bars and if they are done properly the “missing part” that you see from viewing from the front is seen on the right side of the first panel and also on the left side of the middle panel. The reason for this is when you enter a room from an angle this helps to see the photo as if there are no gaps between them and as you swing around to see them from the front then this disappears and your eye fills in the detail between the gaps in an aesthetically pleasing way. The same is true on the right side of the middle panel and the left side of the right panel. There is virtually no restriction in sizes. You can have same area sized panels or different area sized panels, such as one larger panel in the middle and smaller ones either side or even a steadily decreasing or increasing size. They can be rectangular or square panels – as long as your photo will cover the area of all the panels and has sufficient resolution to do so. The heights of Triptych canvas prints can also be varied. Some people prefer to keep all the panels the same size while others prefer to vary the heights. A popular configuration is having the tallest canvas in the middle with shorter canvas prints either side. Alternatively you could have the shortest canvas in the middle and the taller ones either side. You could even do ascending heights from left to right or vice versa. The number of panels is only limited by your imagination. Three, five and even seven panels are popular but the number of panels is only restricted by the sharpness and resolution of the image. They can be next to each other left to right or stacked vertically or even diagonally.